Why is “Tummy Time” important? Those of you who have recently had a baby or have young children have probably heard about “Tummy Time”. This is where you are told to encourage your baby to spend time playing or lying on their front. But why…? Evidence has now shown that the safest position for our babies to sleep in is on their back. This is to reduce the risk of Sudden Infant Death Syndrome (SIDS) or cot death. However it is still vitally important for developing babies to spend quality time on their tummies. If a baby is always on their back, they not only miss out on a different perspective of the world, but they may develop flat spots or changes of head shape and/or poor development of their motor skills. When a baby is positioned on their front, they are encouraged to lift their head and therefore strengthen their back and neck muscles. They also go on to learn to turn their heads from side to side in reaction to what is going on around them. As they get older and stronger, they then start to use their arms to lean on, and strengthen the muscles around their shoulders. This all helps as your baby continues to develop and learn new skills. These muscles are then used as your baby learns to roll, sit, crawl and walk. You can start to position your baby on their front from birth, but many wait for the first few weeks due to the umbilical cord stump. 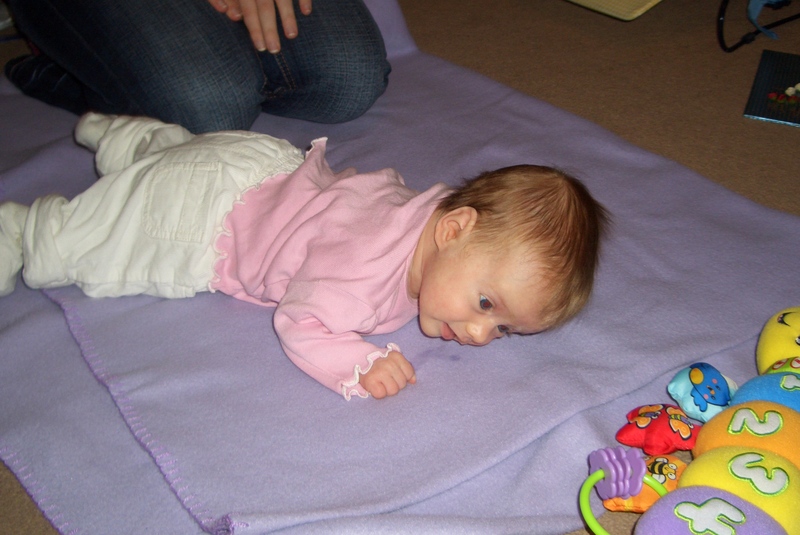 But once this has come away, your baby needs to start to experience “Tummy Time”. The easiest way to start may be to position your baby tummy down but on your front. This way you can feel that you can monitor them closely. Many babies will find the position hard work, especially at first, so little and often is usually the key! There is no set time so do what works for your baby. Please remember that the accepted advice is now that babies should only be place on their tummies when awake and supervised. It is not advised for your baby to sleep on their fronts. If you have any concerns about your baby, or need any advice regarding “Tummy Time” please feel free to contact us on info@therapystars.co.uk or Sian on 07813 764938.
http://therapystars.co.uk/wp-content/uploads/2014/04/Therapy-Stars-header-logo.png 0 0 Sian Boffey http://therapystars.co.uk/wp-content/uploads/2014/04/Therapy-Stars-header-logo.png Sian Boffey2014-06-06 10:54:272014-06-06 11:03:04Why is "Tummy Time" important?